Maximum 2" capacity with boring sizes: 3/16", 1/4", 5/16", 3/8", 7/16" and 1/2"
I finally had a chance to use it this week. I am very happy with the accuracy of the jig. Very easy to use. 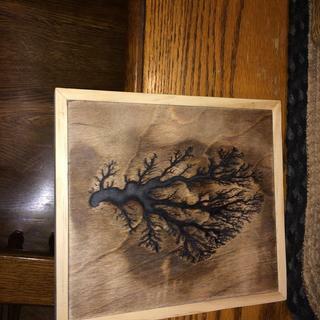 I an making cabinet doors and other things. I use this gauge all the time. Easy to use for Dowling boards and slabs together. Highly recommend. Excellent tool, very tight tolerances make centering a non-issue. Unfortunately tried a cheap knock-off of this jig first and found out what doesn't work. This one does, well worth it. EXCELLENT TOOL-i was able to refurbish an old door, I pulled the door apart then redrilled the old broken dowels, the door fit back together perfectly. Have one that finally wore out . It is an excellent product !! Works great every time. Highly recommend! Exactly what I needed for dowling boards together. Easy to use and works great! I really like this jig! I preferably like to dowel rather than use screws on some projects. Did a few practice runs and my edges come out nice and even. And easy to add a small piece to off center and create a reveal. This jig is very useful and easy to use. It joints wood well and in a timely manner. exactly what I wanted. I built a bench using the dowel jig. They all lined up perfectly. I would reccomend this to anyone. Worked great first time out! Really works great for centering holes in the end of boards. A bit spendy, so make sure it doesn't walk off! Nice tool. 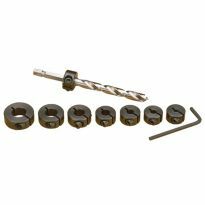 Used with Kreg drill bit and depth collar to ensure consistent depth. Gonna bury some screws and cover with ebony plugs. Great doweling jig; very solid and precise. I was pleasantly surprised. I'm building a solid white oak table top, 1.25" thick, of 6" pieces glued and dowled edge-to-edge. I used 6 dowels per each 42" length, mostly for allignment. The surfaces ended up being flush enough that a bit of hand sanding was enough to finish. I did take great pains to align the jig; this becomes trickier with thicker pieces of wood due to possible paralax between the engraved line on the jig and the mark on the wood. But it's worked every time so far. best tool ever, can do without awesome..
Great dowel jig. Easy to use. 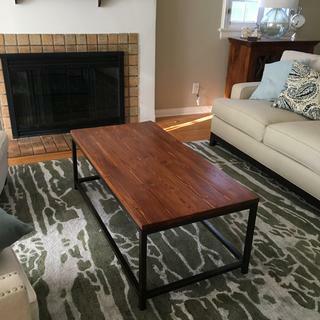 It made my coffee table top project easy to complete. Yup, you will use it! As soon as you get the feel of it, your hooked! A definite tool the will not collect dust in my shop! Dowel pin holes are drilled exactly in the center of the board simplifying joining. Simple to use and it works as advertised. I've borrowed this jig several times from a friend and so didn't think twice about buying it over some other make. Works perfect just like it is designed to do. Worth the price. Great product. This jig works awesome. I am highly impressed with it. 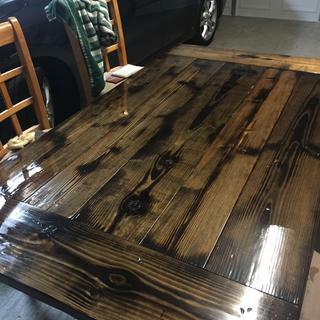 Used it on my table top. It worked well for my bed rail drilling. Works really well! It's very easy to use and a very good build quality. I have finally purchased one of these for myself and it works great! Zero complaints! very good design. simple to use and very precision. even a young elementary student could use this. really cut down on time and errors. I recommend this due to it's ease of use. Excellent time saver. Very accurate. Very impressed with the Quality of this tool. Never having doweled before my first job came out perfect. Absolutely recommend it! Have owned other dowel jigs. This one is by far the best. Just drilled 25 1/2" holes for dowels. Everything lined up perfectly. Cut my time in half. Worked great right out of the package. Made two tests boards and then made approximately 70 dowel hole in my project. Every hole lined up perfectly. Was easy to set up and read marks. Sorry it took me so long to find this tool. Works beautifully, easy to use, easy setup. 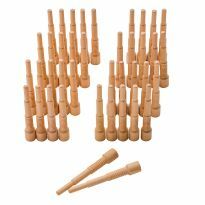 Building a desk for my Daughter and will need to use a bunch of wooden dowel pins. I needed a way to drill the holes precisely and this seemed to be the best way to go about that. Will update when the desk is done. Good internet reviews. 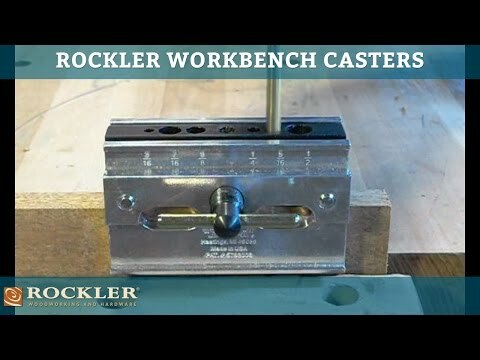 Have ordered from Rockler in the past and have been happy with the products. The quality appears to be far superior to others on the market. I've heard nothing but good things about this doweling jig, and I really need to step up my doweling game! drilling for hidden shelf support. i picked this based on Rocklers reputation and the positive reviews. Other shoppers liked this item & it fits my needs. This will replace a failed plastic centering tool. I am building a 10 ft x 11 ft x 90 inch high pergola and I needed a way to center 1/2 inch dowels on the ends of the diagonal corner braces. recommended on WWGoA for joining raw edge slabs. Need to install a couple of old style door knobs that recess 3-4 inches into the door and are 1/2 wide and 4 inches long. Need to drill multiple 1/2 holes centered on the door edge and perpendicular to the door. This jig will work perfectly for that task. Used to construct 20 screen windows for a screen house and screen doors, as well as plank tables. Works great! I bought on that was made in China.A total mess as nothing lines up.So I am hoping this will be a better product,precision made. 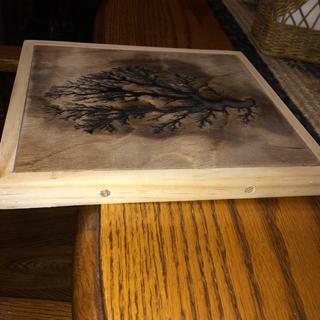 I used this jig that a friend had and I really felt more comfortable that it was done right. bECAUSE OF THE FACT THAT IT IS SELF CENTERING AND THE FACT THAT IT HANDLES 1/2' DOWELS WHICH MINE DOES NOT. THE VIDEO WAS REALLY INFORMATIVE TOO. My son borrowed his friends jig to do a project and really liked it, so thought it would be a great Christmas gift. Reviews say it is the best one. I use this for joining boards for box construction. Accuracy with Dowels is a must. I am expanding my Workbench and needed to make Dowel holes. I bought a 4' piece of Oak Dowel from HD for $4.00, although my friend did the same thing with his, he used 1/2" metal dowel. (cut each dowel with an Angle Grinder) Extremely strong YES, but will not be able to use any clamps that are affixed to the work area, wood dowels are better. I'm making some cabinets and needed to make the face frames and doors square. 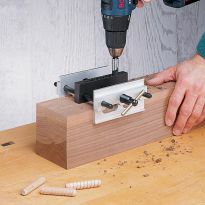 The 3/16" drill slot that is included on this jig is perfect for my project. And the other drill slots will work for future projects. Beginner wood working hobbyist.... Want to create small raised bed boxes for garden, and practice dowel joinery taught in class. I struggle with precision in all I build and repair. My other one wore out after many years of use and I couldn't get new sleeves for it. how do you make the jig holes centered? 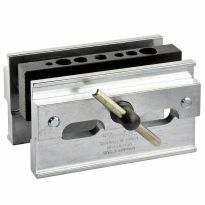 BEST ANSWER: After tightening the vise, the holes will already be centered along the thickness of the board. If you want to center it along another dimension as well, then you will have to measure and mark the center yourself on the side of the board and then use the markings on the side of the jig to line up the hole you want with your marker. 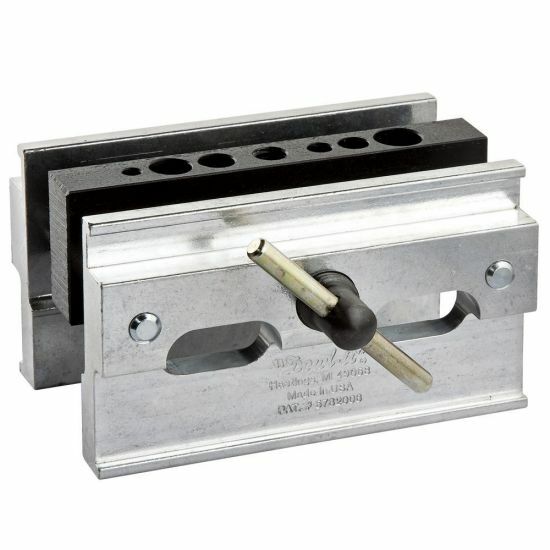 Well as the add states it's a SELF CENTERING DOWELING JIG. Works great no problem. Check out the video. The jig is self-centering. 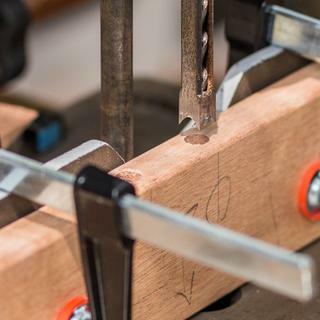 The jig holes are centered by tightening the jig on the stock before drilling. Can you make it so it doesn't self-center so you can offset the holes a fixed amount? 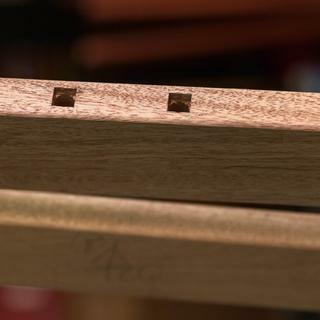 I often put dowels not in the center but in a specific offset from an edge. BEST ANSWER: Yes, you easily could. Just put - like a 1/4" piece of wood on one side of the piece you're putting the dowel in. That would offset the dowel hole position. You could adjust the amount of offset by the thickness of the "shim" you added into the fixture. I just started using this doweling jig and love it, very well made and accurate. Hope this helps. Roger L.
The two sides of the vise come together equally and the hole is always at the center of them. 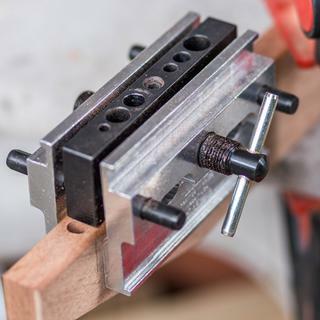 So you could add a shim next to your board and clamp the vise on both. Then your hole will be offset from your board based on the width of the shim. Use the same shim consistently to get a constant offset. Sorry, my answer got cut off there. As I was saying, once you add a shim, the jig will then center to the total width of the board + the width of the shim. Just do some quick math to figure out how thick your shim needs to be to move your dowel holes over and then you can use it repeatedly. Make a spacer for one side of the jig the amount you want to offset your holes. You can use a little 2 sided tape to hold it in place. Have a set made up for different offsets. Choose a material that will stand up to repeated use. Hope this helps. Yes, if you use a board the same thickness as a spacer on either side of the jig, you can have the holes offset to either side you prefer. is there marking pins with it. the metal point things you put in hole you drilled to mark the other part? BEST ANSWER: No, there are no marking pins with the jig: it's just the jig itself. Hope this answers your question. No the marking pins do not come with the doweling jig, you will have to purchase them separately. I don't recall there being any location markers like that. I think I bought them separate. While you may be able to use it with a marking pin, none are included when you purchase it. what is included with item # 49221? This is a one-piece adjustable unit, so that's all there is in the box. Other associated items, such as pegs or glue, are separate purchases. I've been very satisfied with my unit; it has worked on several different projects. 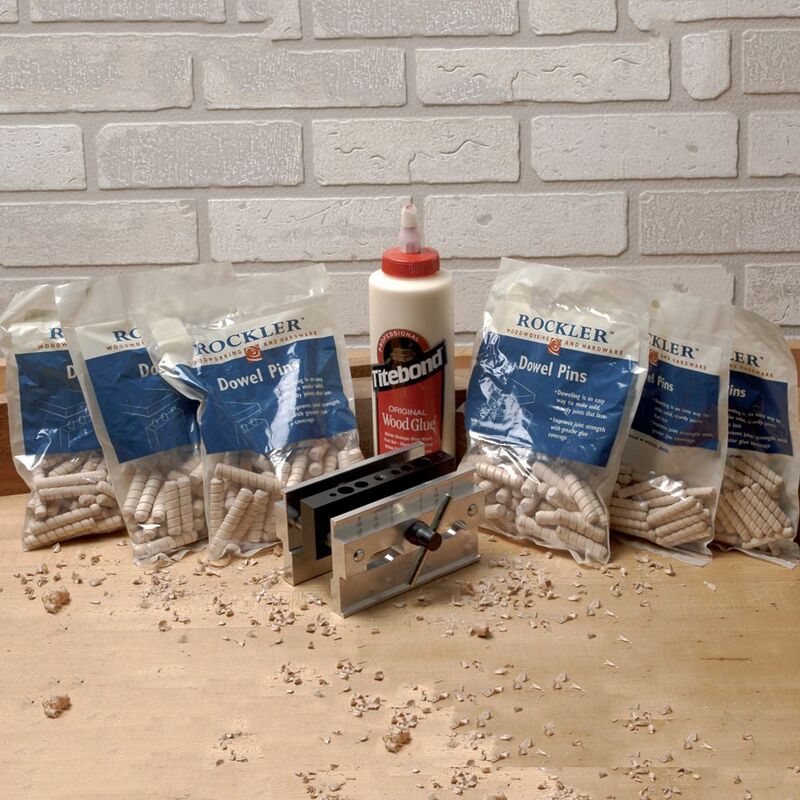 If you order the doweling jig that is all you will receive, but if you want the complete kit of glue and different size dowels you can order #10488 and receive it all. Hope this helps. This comes as a single item that you see pictured. Each of the holes along the top is a slightly different size so there is no need for any kind of adapters, plugs, or accessories. Did the dowel pins and glue come with the doweling jig? BEST ANSWER: No dowel pins or glue, just the jig and an accurate tool it is. How do you line up the jig so that holes on both pieces perfectly match? 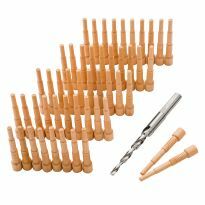 Drill a hole on each piece and use a pin to line up? Usually you get some inserts with a little point on them that you put in the holes and press on to the joining piece. Drill on the indentions. What is the minimum wood thickness this jig can do? I have a project that is 7/16" stock. BEST ANSWER: It closes down to just a little under 3/8" so 7/16 should hold tight enough but you can always sandwich the material between two pieces of equal thickness lumber. It just makes marking the alignment a little clumsy but it's certainly do-able. I've used one of these clamps professionally for over twenty years and have done that a few times. 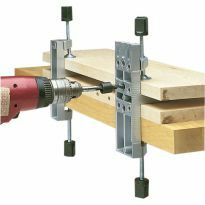 I bought one of these dowel jigs and although I have used it for okay results I have one complaint. The aluminum clamp edge does not line up with the tool steel drill guide. I think these components should line up flush on the edge. It makes it tricky to get repeatable results. Drilling on the edge of a board you can square up the edge with a piece of square material no problem, but when you go to drill the end of a board the tool steel ( black inner part ) is your reference edge but it is a good 16th of an inch difference from the aluminum clamp edge ! making your dowel holes off slightly and one does have to kind of 'eye ball' it to get good results. How do I line up the pieces properly with 2 different edges on the dowel jig? Can you give any instructions ? BEST ANSWER: I have bought a couple of these jigs and I am not sure if this is answering your question correctly as I might not understand what you are saying but I did get one that had the guide off center as the holes were not dead center on the jig. I mentioned it to Rockler and they sent me a new one with the Holes lined up correctly. If this doesn't answer it correctly as to your issue, there are thin guidelines on the side of the jig that I use to line up the holes to be drilled and I make a perpendicular line from the hole area I want drilled and line it up with the guides line. Other way to line up, is to site down the hole with a small flash light to see if you are dead nuts on where you are expected to be drilling. Hope this helps! Is there a metric version of this item? BEST ANSWER: IT IS METRIC OR SAE ALL AT THE SAME TIME. ONE SIZE FITS ALL. What keeps the centre block with the holes in the centre of the stock ?.I bought another brand and I have to place shims on either side of the centre block. BEST ANSWER: the block is self centering. It's well made... As you close the tool each side moves to the wood evenly. How deep on the stock does the jig reach? BEST ANSWER: The depth will be determined by length of your drill bit.The width is 2 1/4”. 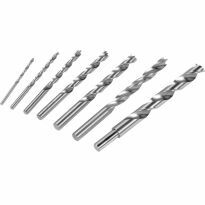 need to drill a 4mm hole in posts for wire .do you have small metric drill sizes ? Can miter dowelling be performed with this jig as for picture frame or trim work? BEST ANSWER: Yes, all that matters is that you line it up accurately and that the stock has parallel sides. There are probably better tools (or jigs) than this for that operation though. I've had mine for 3 years and never used it. does anyone know where i can get a 3d solidworks model of this component?